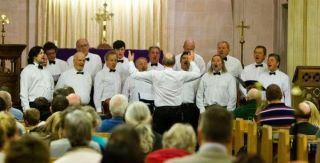 Hello and welcome to the web presence of Pewsey Male Voice Choir (founded Nov 2006). We meet at 7.45pm every Monday in The Crown, Wilcot Road, Pewsey or, nearer performance dates, at St.John the Baptist, Church Street, Pewsey. New voices are always more than welcome so why not just drop by and join in? Or use the form on the Contact Us page to let us know you are interested in coming along or booking us for a concert.